Women's 5mm court design tungsten carbide ring with a textured brushed finish to the outside whilst the inside has a high polished finish. The ring is a court design which is both rounded on the inside as well as the outside. The ring is marked on the inside "Tungsten Carbide"
This ring is part of our new "Low Profile" range with a depth of just 2.0mm, most tungsten rings tend to be between 2.3mm and 3mm in depth. This reduced depth means that the ring will be more comfortable in wear, especially in the smaller finger sizes. The ring is available from stock in finger sizes J to T. A polished version, see TURL5 is also available. 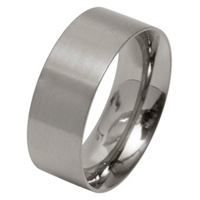 The Womens 5mm Brushed Tingsten Ring have an Satin Brushed finish.